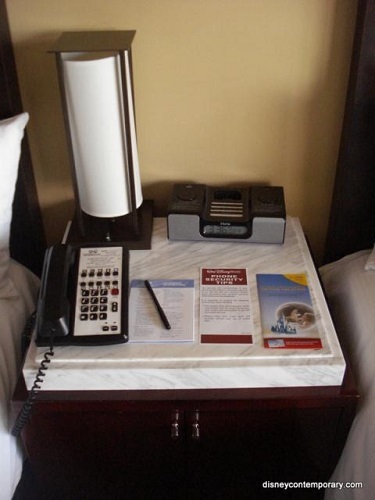 The next time you check into a Walt Disney World Resort hotel room you might notice that the alarm clock is missing. Don’t be “alarmed” – Disney is reportedly removing all clocks from the resort’s hotel rooms. We were first made aware of this when a member of our team reported that her room at Disney’s Contemporary Resort was without a clock. When she called the front desk she was told that all the clocks had been removed but guests can still request a clock if they need or want one. After contacting Disney Vacation Club Member Services, a cast member did confirm that clocks are being removed at ALL Walt Disney World Resort hotels and DVC Villas. Guests will need to request a clock from the front desk. How do you feel about the removal of clocks from the Disney hotel rooms? Let us know in the comments. I like the alarm clock just so I can see what time it is…….I will either pack one or ask in advance that one be in the room …..When is Disney I don’t take cell phone or tablets so I don’t need extra space on the table. I just want to see what time it is. I like the alarm clock. We use it to make sure we’re up for early morning extra magic hours. Not happy about clock being removed. I like to be able to see what time it is at night or early hours without having to turn light on or fumble around bedside table to find cell phone, waking myself up enough that I’ll never get back to sleep. I guess I’ll be requesting one. We don’t need the extra outlet, I travel with a compact travel extension unit. Has 3 or 4 outlets and USB.